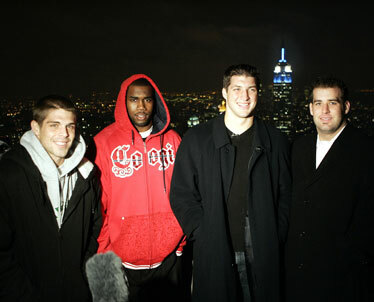 The four Heisman finalists, from left, Colt Brennan, Darren McFadden, Tim Tebow and Chase Daniel caught the view of the New York City skyline from the top of Rockefeller Center. NEW YORK » On a day when the temperature here dipped to freezing, Colt Brennan got a warm reception. » When: Today, 3 p.m. Everywhere Brennan went, from the Newark International Airport to his hotel to Rockefeller Center, fans wanted a piece of him. As he usually does, Brennan accommodated as many as possible. In a city full of luminaries, it is his time. The first Heisman Trophy finalist from Hawaii arrived in New York in time to have lunch with the rest of the final four -- Chase Daniel of Missouri, Darren McFadden of Arkansas and Tim Tebow of Florida. Today, at 3 p.m. Hawaii time, the winner of the 73rd Heisman Trophy will be announced. The award is bestowed upon college football's most outstanding player, as voted on by nearly 900 media members and former winners. ESPN is televising the event, live from Times Square. Brennan seemed to gain ground the past few days, at least in public opinion. But the voting closed Wednesday, and most observers think Tebow is the winner. Some say McFadden, the lone running back among the finalists, might benefit from a split vote since the other three are quarterbacks. Brennan said there was no tension between him and Tebow due to remarks by UH coach June Jones earlier in the week in which Jones described Tebow as a "system quarterback." "It was very casual, very friendly, a good time," Brennan said. "We understand the game we play and all the media and all the hype. I've got a ton of respect for Tim and I hope he's got a ton of respect for me." NEW YORK » After a red-eye flight from Hawaii and a day and night of experiencing New York with his fellow Heisman Trophy finalists, Colt Brennan was ready for some rest at 11 p.m. Eastern time. And he would need it, with another big day today. Brennan and the college football world learn at 3 p.m. Hawaii time if the UH quarterback was able to pick up enough late support to upend Florida quarterback Tim Tebow and Arkansas running back Darren McFadden for the sport's biggest individual award. Missouri quarterback Chase Daniel is also here as a finalist, but McFadden and especially Tebow are considered the favorites. Brennan -- the first player in UH history to even dream of reaching this lofty status -- didn't sound confident about his chances of winning it. "I'm really excited to be a part of it," Brennan said, after completing a double-decker bus tour of the city and before a pizza party that would cap the evening's activities. "There's always a possibility. But considering the fact that I didn't get invited to the Johnny Unitas or the Maxwell or the Camp (award shows), watching the way the awards have gone the past week, I'm just grateful to be here. I'm not too optimistic about me winning anything tomorrow." A lot of the Heisman buzz lately has been about Brennan, partly because he led UH to the nation's only unbeaten regular-season record (12-0) in major college football this year. Superb performances against Boise State and Washington to close the season made some voters and analysts take another look at Brennan. "I definitely see a lot of people coming around the last few days, and you can make any case you want," Brennan said. "This was a much better year and we did a lot better things." While the 10th-ranked Warriors improved their win-loss record from 11-3 last year, Brennan's individual statistics aren't as eye-popping as 2006, when he threw an NCAA-record 58 touchdown passes. The numbers guy this year is Tebow, who accounted for 51 touchdowns, and against a tougher schedule than what Brennan faced last year or this. A Brennan fan from Queens, who followed the UH quarterback around all day, said he should have been a finalist last year. "Just watching his highlights from the past. I mean, last year I believe he deserved the Heisman more. This year I believe they invited him for the mistake they made last year," said the man, who did not want to give his name. "Brennan has a good chance of winning, but I think it will be Tebow because he did something no one else did with 20 touchdown passes and 20 running." Regardless of the final voting tally, Brennan being here as a Heisman finalist is one of the greatest achievements ever by any UH athlete. "It doesn't matter," said Terry Brennan, Colt's father. "He already hit a home run by being here. Now it's just a matter of seeing if he hit a two-run homer or maybe a grand slam." The finalists got to know each other over lunch yesterday. Brennan met McFadden and Tebow for the first time and got reacquainted with Daniel. "I had a chance to hang out with (Daniel) this summer at the Elite Eleven football camp," Brennan said. "I think he's a character, he's a real funny kid." After some free time, they went to the High School Heisman dinner, featuring some of the top prep players in the country. Then they toured the city. Brennan was scheduled to be interviewed today on ESPN SportsCenter live at 7:45 a.m. Hawaii time. Nearly 30 former Heisman Trophy winners are expected to be in attendance at today's announcement ceremony at the Nokia Theatre in Times Square.